The aim of the Workshop is to make sense a modern anthropological situation and to discuss what is the ‘practice of the Self’ today. The Workshop wants to provide a forum for speakers of different professional and intellectual backgrounds — academical reasearchers and practical experts in contemporary art, design, education, dramatic art, political technology and other practical fields. prof. S. Horuzhy (Moscow). Synergetic Anthropology: Base Principles and New Investigations. -I. Lapova (NSUEM, Novosibirsk). Marginal Features of Modern Urban Activities. V. Efimov (Siberia Federal University, Krasnoyarsk). A Town in Education: Toward Mind-Construction of Life. Presentation project “School Urban Activities”. (Center of Visual Anthropology, Moscow State University). -A. Shepilov, I. Chernyshov. Pilot Programme “TerRa”: Approaches to the Activity Potencial Development of people in Regional Perspective. General Discussion introduced by S. Smirnov, S. Horuzhy, O. Genisaretsky, V. Efimov. 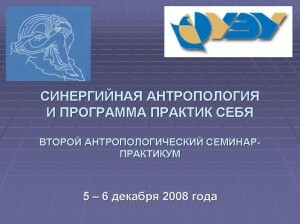 “The Area of Anthropological Projects in Russia”. 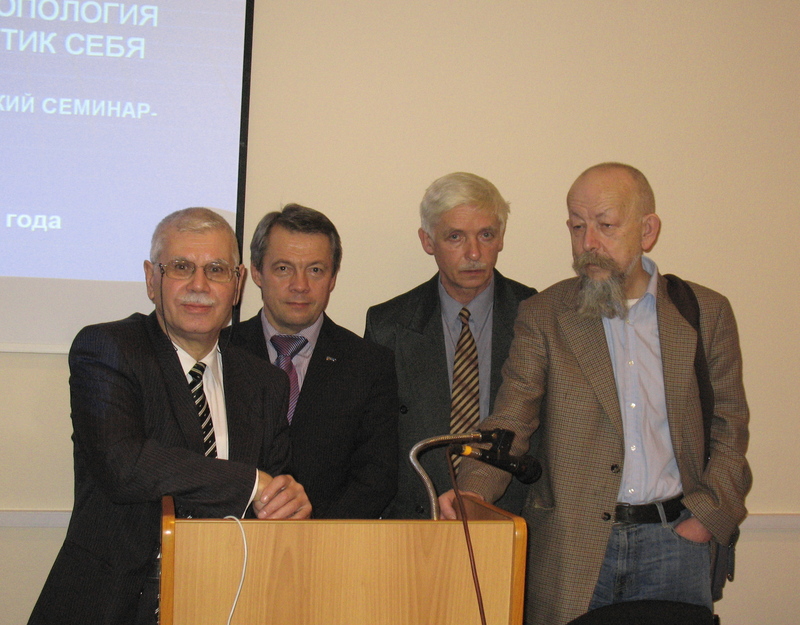 Speakers: prof. S. Smirnov, prof. S. Horuzhy, prof. O. Genisaretsky, V. Efimov. -Which resources are deficiency for working up and carring out the anthropological projects? -What are opporunities and limitations in the project approach to the anthropological discourse? -L. Shevchenko (Tomsk). Humanitarian Designing. -L. Kobzeva, K. Goloshubin, V.Ponomarenko, E.Klymchuk, E. Gribov, I. Kuznetzov, A. Igoshin (Tomsk). When does the humanity come to ourself? Effects of the Project “Action is which required”. - V. Efimov (Siberia Federal University, Krasnoyarsk). The Project-scheme of the Philosophical-methodological School “Education and Intellectual Practices of XXI centure”. Showing the film about Merab Mamardashwily, the philosopher, and follow-up discussion. Plenary Debate on the Results. The aim of the Workshop is to consider new views, ideas, projects in the anthropology which are important for analisys social changes and Human Being transfomations. 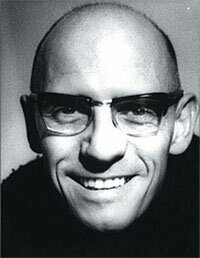 One of fundamental views is presented by Michel Foucault’s concept of “practices of the Self”. Foucault introduced this concept in last years of his life. Earlier he has written about “practices of the Knowledge” and “practices of the Authority” as basic processes in the social constitution. Introducing new concept was — in Horuzhy’s opinion — meant the Anthropological Turn in decomposing a social processes. Sinergetic Anthropology has used such concept too, but it has another way to think about “practices of the Self”. So one of the task of this Worshop was to make the comparison between this two discources. Another task was to examine various cultural practices in the prizme of this two discourses. prof. S. Avanesov (Tomsk State University). Realization of the Self and Creation of the Self. G. Petrova (Tomsk). To Care for the Self: Is it technology or anthropology? A. Smirnov (Irkutsk). Chistian Ascetics and Germenevtics of the Subject. Ja. Kushnarenko (Novosibirsk). About the Basis of Synergetic Anthropology: essence-energy dialectics. Film: “Return to Ange” by R. Ernazarova. prof. O.Genisaretsky (Moscow). Something about Cognitive-Strategical Navigation in the Field of Person/Family and Think/Activity Crossing. A. Elashkina (Novosibirsk). Thinring as Anthropological Practice: the educational aspect. L. Shevchenko. The Anthropology of a Fiction. Plenary Debate: “Anthropology of Generations.